Nov. 13, 2017 1:02 p.m.
Parksville’s park poplars are proving unpopular and will have to be toppled. Roots from a row of mature poplar trees along the fenceline separating Community Park from the Surfside RV Resort have pushed through a paved walkway and parking lot, and threaten the adjacent fence, city parks foreman Warren Payne said. The city will remove the trees in December and replace them with young maples. Recently, the city took down two mature fir trees adjacent to the outgoing splash park in Community Park. The new splash park, slated for opening in the spring of 2018, needs to move slightly from its current location and the trees were in its path. The release said the city has removed fewer trees from its urban forest this year than it did in 2016, although regular inspections and requests for service calls have resulted in hazard mitigation, including removals. Other reasons for tree removals in addition to the dry weather include the protection and development of infrastructure. The City of Parksville continues to meet challenges managing our urban forest. We experienced another very dry summer this year and the trees in our community continue to struggle. Part of the management of the city’s urban forest is a replanting program in partnership with BC Hydro and TD Canada Trust. Tardiff said the city received two grants to replant trees in the city this fall, and teamed with Friends of Foster Park in a TD Tree Day in September to plant 244 trees, shrubs and other plants in Foster Park. The second grant, from the BC Hydro Re-Greening program, funded the planting of more than 300,000 trees across the province over the past two decades. Through this program, Parksville received funding for replacement trees in its urban forest and along city streets. Payne told The NEWS seven “decent-sized” maple trees will be planted near the area where the poplars are being removed, though not in the exact fenceline location. 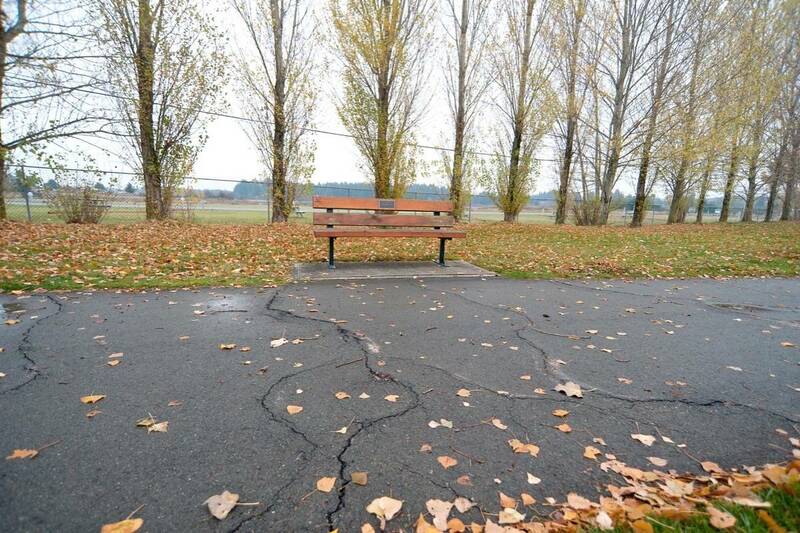 Payne said parks inspectors were initially concerned the cracking in Community Park’s paved path and parking lot was caused by pine trees that are much closer than the poplars. They realized the truth when a sprout grew out of the asphalt and produced poplar leaves. The pine trees will remain, the city release noted. Root pruning of the poplars was dismissed, said Payne, because with this species of tree any cut to a root would result in both the severed root side and the side attached to the tree to sucker dramatically.